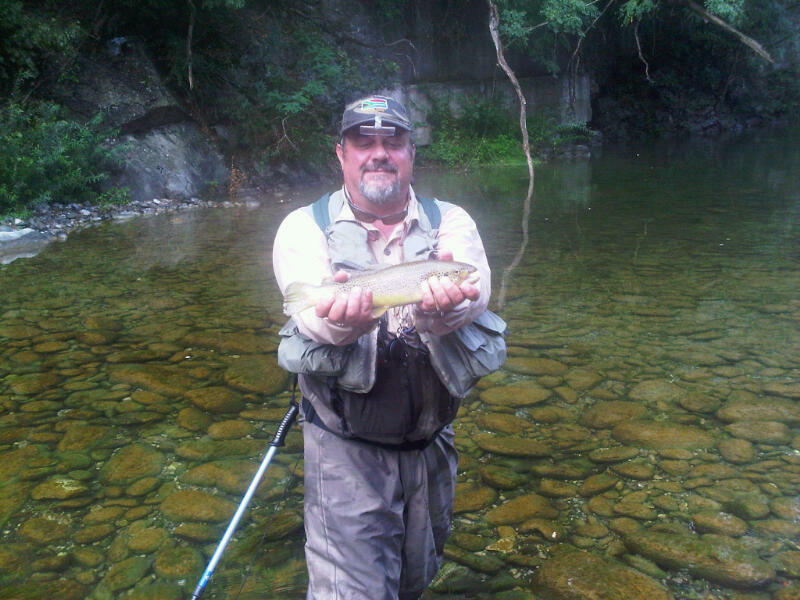 I just came back from a truly memorable day's trout fishing in northern Tuscany, near Lucca. 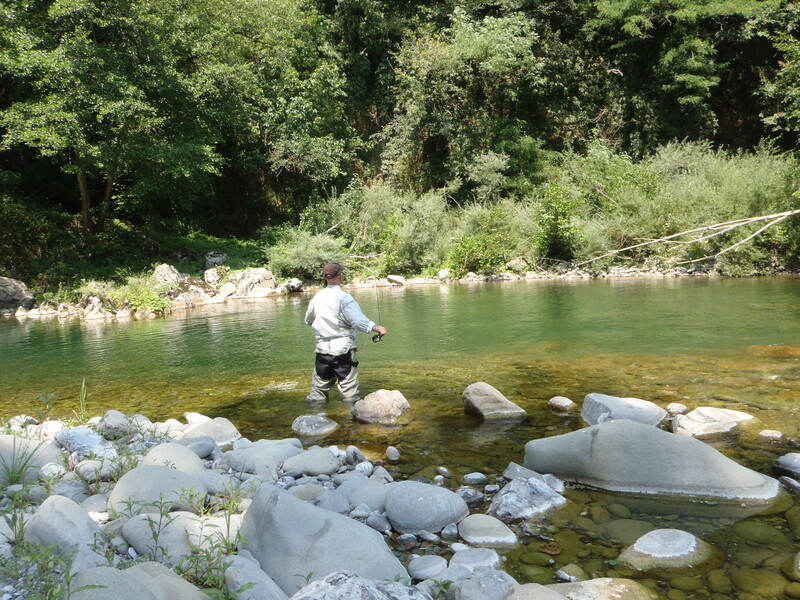 My old friend Moreno Borriero, who has been my Italian fishing guide over many years now, had finally persuaded me to make the 2 hour drive north from Gaiole up to Bagni di Lucca, to fish the Lima River with him (as opposed to driving to the Tevere or the Nera, our more usual haunts). The Lima is Moreno's local patch and improving the fishing has been a project of his - a labour of love and dedication - over many years. This has involved winning over the local council and local opinion to support a combination of free and private waters, gazetting areas of catch - and - release, licensing systems, anti-poaching drives etc. 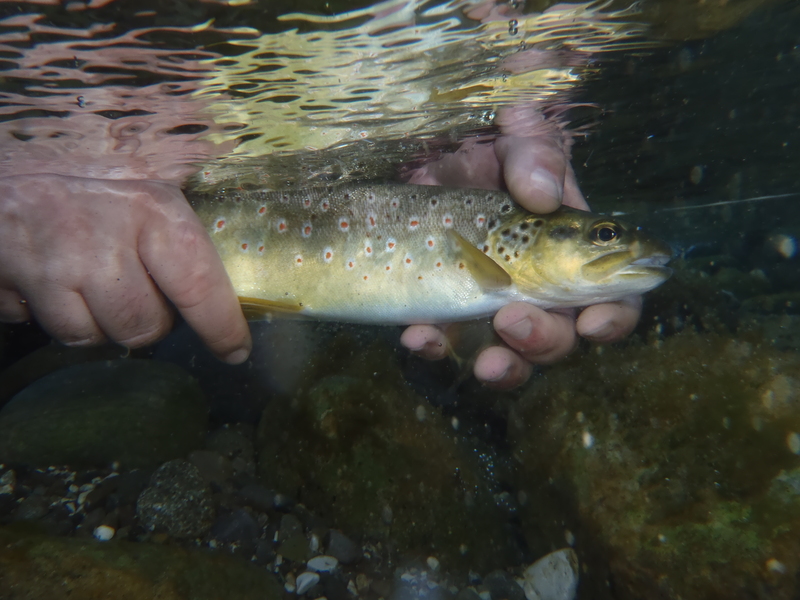 A beauty caught by Stephen in a large pool with slow flowing water. A lot of hard work and dedication...and it has paid off. 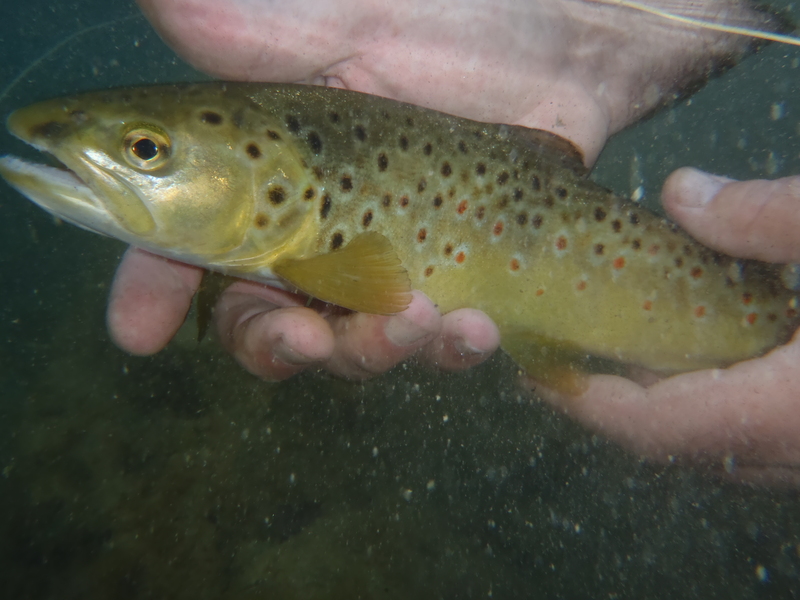 The result is a beautiful stretch of river that is absolutely stuffed full of large, wild brown trout. I caught 15 or more (we agreed it was pointless keeping score after the first handful - we adopted the Bushman's method of counting, which is "1,2,3,4, many..."). All of them were healthy, vigorous, hard-fighting, beautifully marked and well-shaped, varying in size between 1 and 2.5 lbs. All were returned and swam off rapidly back into their respective pools, hopefully none the worse for the experience. 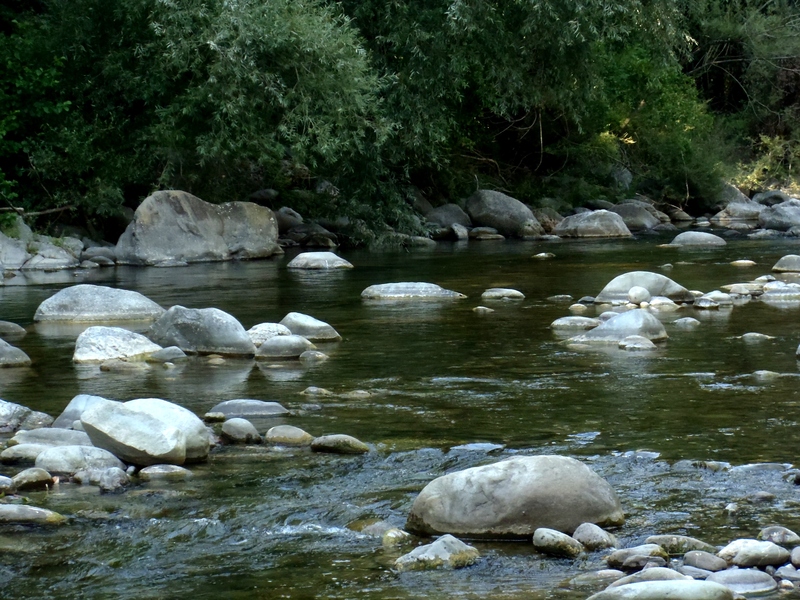 The water is varied and interesting; large, still pools, rapids, riffles and mini-cascades. It is clean enough to support a healthy variety of insect-life, including the notoriously delicate and pollution-susceptible stone-fly, as well as various ephemera, sedges, etc. There are plenty of fish - even the smaller pools seem to contain a surprising number of large fish. 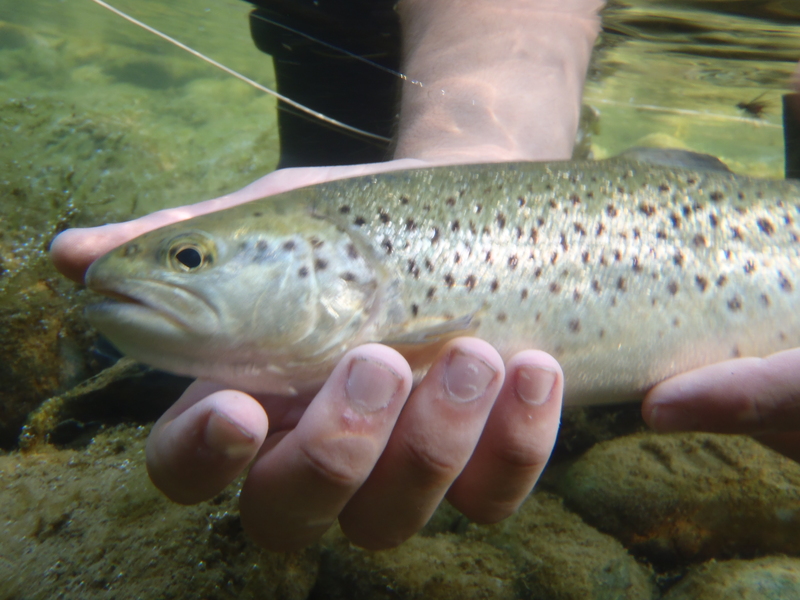 The trout are finicky (ie you have to take care to present the right fly, in the right way, otherwise they will continue to rise maddeningly in front of you, while spurning your pathetic offering). The strike is usually very fast and your reflexes have to be quick, especially in the faster water, otherwise the fish will spit out the hook, and return to its position of invisibility at the bottom of the river, before you have had time to react to the subtle flurry in the water and brief flash of bronze near your fly. The casting is reasonably easy - ie the river is open, not enclosed by trees and vegetation. But I still managed to lose an embarrassing number of Moreno's beautiful hand-tied flies, usually when trying to reach an over-ambitiously distant rising trout in response to a challenge from my mischievous guide. There was the usual "dead" period of inactivity between noon and 4pm, but that is the time to drive off to the local cafe for pasta, crostini, wine and polpettine (or whatever takes your fancy from that day's menu) while you catch up on each other's news, swap tall fishing tales and put the world to rights. Then it's time to go back to the river for the evening rise. In our case there was a brief rainstorm at about 4.30pm which forced us to shelter under a bridge, with my graphite (ie electrically conducting) fishing rod put carefully to one side while thunder and lightning crackled around us, until the skies cleared again. After the rain, a steamy mist rolled through the river valley and introduced a primeval sense of atmosphere. It didn't seem to put off the trout, however, and we continued to fish until it was too dark to see the fly landing. There were still a constant series of intriguing splashes, rolls and flurries going on in the far reaches of the pool when we reluctantly dragged ourselves away from the riverside at 9.00pm.